(Newser) – The creator of the pink plastic lawn flamingo, the ultimate symbol of American lawn kitsch, has died. Donald Featherstone was 79. Featherstone's wife, Nancy, today told the AP that her husband died yesterday at an elder care facility in Fitchburg, Mass., after a long battle with Lewy body dementia. 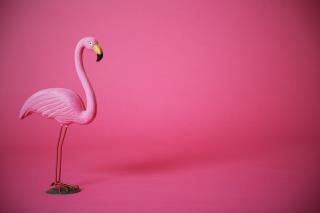 Featherstone, a trained sculptor with a classical art background (he studied at the Worcester Art Museum), created the flamingo in 1957 for plastics company Union Products, modeling it after a bird he saw in National Geographic. Millions of the birds have been sold. I am buying one tomorrow in his honor. I hope tomorrow. I live in the dessert so I will at the least order one tomorrow. I hope his family uses a cheap head stone cause I get the feeling someone will take it and fly around the world taking selfies with it. The pictures I've seen of some of the flamingos that were taken and then appeared quite some time later with pictures of thier trip is interesting to say the least.